A quick update about the office remodel: We are getting closer to the finish line. New floors and cabinets will arrive at the end of August, and to celebrate the completion of the project, we are throwing a blowout Fall Aesthetics Event in October. Stay tuned for details. Our next big construction project, which started this week, is building our new office in West Cobb in partnership with Marietta Dermatology. Kelly Houmand, PA, who brings more than 7 years of aesthetic injector expertise and has worked by my side for the past 1½ years, will be heading up our new satellite office. 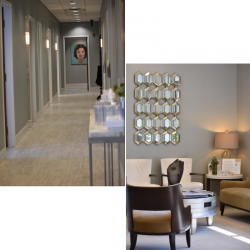 She and her team will provide the full array of non-surgical aesthetic services including the Injecta-Lift™ procedure, laser treatments, CoolSculpting™, facials, skincare adviceand products. Recently, I added a section to our website in the “Procedures” section that I call “Aging, Decade-by Decade.” It addresses many of the facial aesthetic issues that commonly arise with each passing decade and provides practical advice for correction. I want to share with you one section that I know many of you will never read but contains a perspective that can only be achieved with the passage of time. Though patients in this decade are less frequently focused on aesthetics, there is a growing subset who are living long, healthier lives, staying fit and wanting to look good. My philosophy and approach to those in their ninth decade mirror my recommendations for those in their eighth decade. Some of my most satisfying surgical rejuvenation cases have been on women in their 80’s. A couple of patients’ stories stand out. One patient who had full facial rejuvenation surgery at age 83 sent me a card when she turned 100 telling me that she was still looking good and how much happiness she has derived from her surgery. The other patient had complete surgical facial rejuvenation at age 80 and at her one-year follow-up visit, her husband told me that he finally had his “trophy wife.” Now that says it all! It is often said that youth is wasted on the young. A corollary to that statement is the fact that when we are young we are often the most self-conscious and the least confident about our appearance, which is unfortunate since this is when we are at our aesthetic best but are too naive to realize it. For me, the takeaway is that we should be happy and confident throughout life, but if something bothers us about our appearance, let’s not wait to address it because that is one day less we have to enjoy it.